Villa Baan Bon Khao is a stunning hill-side luxury retreat that overlooks the beautiful bays of Surin and Bang Tao. The villa blends traditional Thai architecture and contemporary design effortless, creating a stunning light-filled palace where guests can choose to lounge and dine in or outdoors, never having to give up on gazing at the breathtaking ocean and sunset view. Professionally trained staff awaits you upon arrival to look after you during your stay with warm Thai hospitality, making it hard to leave this wonderful 4- bedroom holiday haven indeed. The luxurious master suite takes up the entire top floor of the villa. Full length glassed walls promise magnificent ocean view to take your breath away every morning again after a perfect night sleep on the comfy king-size bed. The gorgeous teak floor and high soaring timber roof combined with the natural sunlight shining in, give a warm ambiance to the space. The room is furnished with a relax chair for curling up with a book and a TV with DVD-player for entertainment. A walk-through dressing-room leads to the luxurious en-suite bathroom, fitted with a sea-view jacuzzi bathtub. 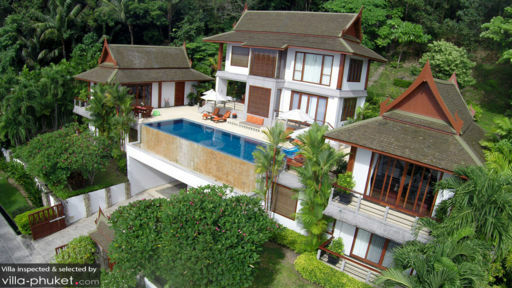 Villa Baan Bon Khao houses three more deluxe villa suites, one fitted with a king-size bed and two with twin-beds. Each room features a terrace or balcony, elegant wooden flooring, air-conditioning, walk-through dressing-rooms and private en-suites with bathtubs to soak in after a wonderful day of swimming, lounging and barbecuing. The outdoor area of villa Baan Bon Khao comprises a sunny sand-washed deck that encompasses the glistering salt-water infinity pool. While cooling off in the pool or suntanning on one of the pool-side loungers, guests can gaze at the magical ocean view. The outdoor sofa lounge with sound speakers makes a perfect spot for enjoying sunset cocktails to the view of the Thai blue sky turning red and orange. A delicious alfresco BBQ dinner beneath the stars completes another wonderful day on this paradise-like island. 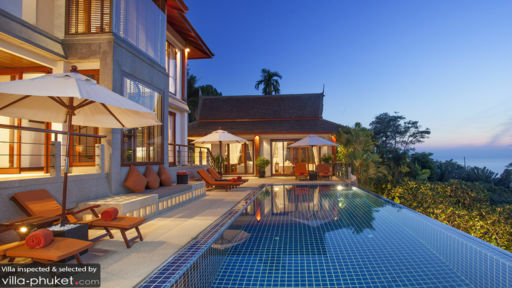 The swimming pool is flanked by the living and dining pavilions of villa Baan Bon Khao. The pavilions features a Thai high vaulted ceilings and full length glass windows and doors, maximizing the ocean views. The use of polished teak wood and white cushioned sofas give a warm and elegant feel to the living spaces. The comfy lounge corner is perfect for day-time relaxing with a good book or watching movies altogether on cozy in-villa evenings. The pavilions are topped off with air-conditioning and ceiling fans, making it nice and cool places to escape the tropical heat outside. The villa is fully staffed with attentive butlers, maids, an excellent Thai chef and security guards, making your stay most pleasurable. A driver and a 10-seat minivan are stand-by to take you on day-trips or drive you down to the beach as a complimentary to your stay. 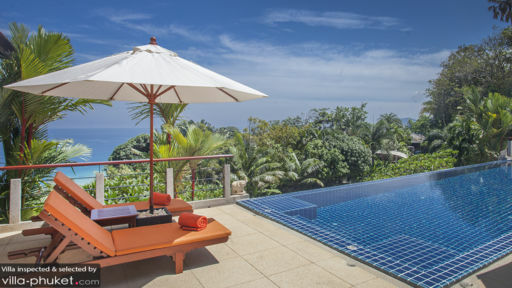 The villa is located on the west coast of Phuket island, just 500 meters from the golden sands of Surin beach and the azure waters of the Andaman Sea. In walking distance of the villa you will find some famous dining venues such as Catch Beach Club and Taste, both located on the beach for wonderful sunset drinks and snacks shared with loved ones. Surin Plaza offers an abundance of boutique shops for those wanting to find gifts and clothes. The airport of Phuket is 23 kilometres away.